All young children, from infants to kindergarten, exhibit a variety of behaviors throughout each day. Some days your child may be smiling and full of energy one minute and the next minute nothing seems to satisfy him. This is normal behavior and is a way children express themselves at an early age. 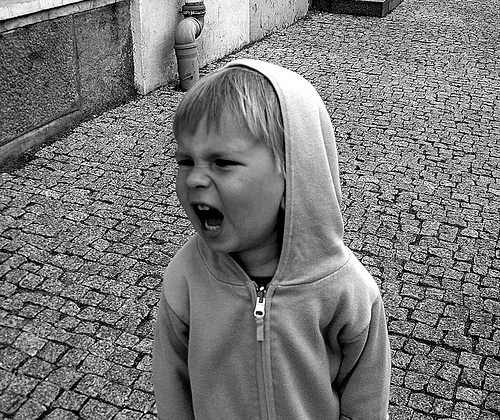 Some children, however, exhibit behavior that is more aggressive in nature and on a more regular basis. Understanding why these children exhibit these behaviors and how to build a positive adult-child relationship is crucial in providing positive long-term social and emotional development. In recent years, psychologists have been validating the long used idea that there is no such thing as a “bad kid.” Instead, these “bad kids” are simply children who have child behavior problems they cannot fix on their own. Dan Gartrell and Michael Gallo, the authors of Guidance with Children Who Show Challenging Behaviors, believe it is critical for parents and educators to acknowledge a child’s actual age and stop expecting certain emotional maturity from children when it comes to handling conflict. The article delves deeper into guidance including how to calm and teach children in conflict situations as opposed to punishing them. If parents and educators can help children learn from their mistakes and solve their problems then a positive and open adult-child relationship will develop. It is important to understand why some children have challenging behaviors. Research has discovered two basic brain processes that explain behavior in young children. Early on, infants exhibit what are called survival behaviors– what most might think of as a “flight or fight” response. Crying is the clearest example of this behavior in infants. Around the age of three, children begin to develop executive functions. These include interpreting current experiences with memories from past experiences and forming concepts and action tendencies. Children who are continually exposed to conflicts begin to view them as everyday occurrences and will develop extreme and aggressive reactions. Toxic stress begins to build and develop which is stress in a child’s life that they are unable to manage. This stress can eventually lead to aggressive outbursts in certain conflict situations. We can also look at a child’s challenging behavior as a sign that something isn’t right or his/her needs are not being met in some way. While there are many factors that can cause these behaviors, it is important to be able to understand and interpret what message a child is trying to convey. Some of these normal behaviors are simple, such as being hungry, tired, or bored. Other types of child behaviors can be harder to interpret, such as a child that hits or kicks someone. These types of challenging behaviors can be the child expressing how they are feeling without being able to put it in words. One of the most important things to keep in mind when dealing with child behavior problems is to base your expectations on the child’s age and maturity level. Redirecting young children from a negative behavior to more positive behavior is one of the best ways to discourage behavior problems. Once the child begins to show positive behavior, it is important that they are praised for this so they can better understand what positive behavior is expected. When we focus on teaching children how to resolve conflicts, they will begin to handle emotions in a more positive and productive way. It is not enough to simply tell a child what they are doing wrong, parents and educators must model appropriate behavior as well. Another thing to keep in mind is that a child’s behavior problem may not be a one-size-fits-all answer. There are many reasons why a child has behavior issues and what works for one child may be very different from what another child requires. When behavior isn’t improved through redirection or modeling then perhaps the environment needs to be altered because factors such as light, sound, and physical space all play a role in children’s behavior. Overall, patience and good communication through redirection and modeling will be the most effective ways of handling challenging behavior in young children. At The Compass School, the environment is seen as the “third teacher” and reflects the children, educators, and parents. In this Reggio Emilia style environment, educators and parents work together to meet the needs of the children. This parent-teacher communication provides detailed information regarding your child’s social, emotional, and cognitive development is essential.